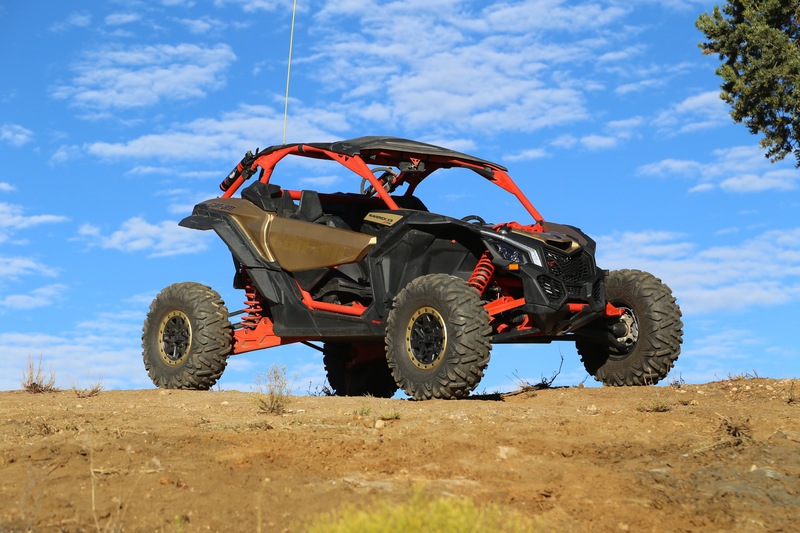 Can-Am is breaking new ground in the side-by-side market with their new Maverick X3 platform. 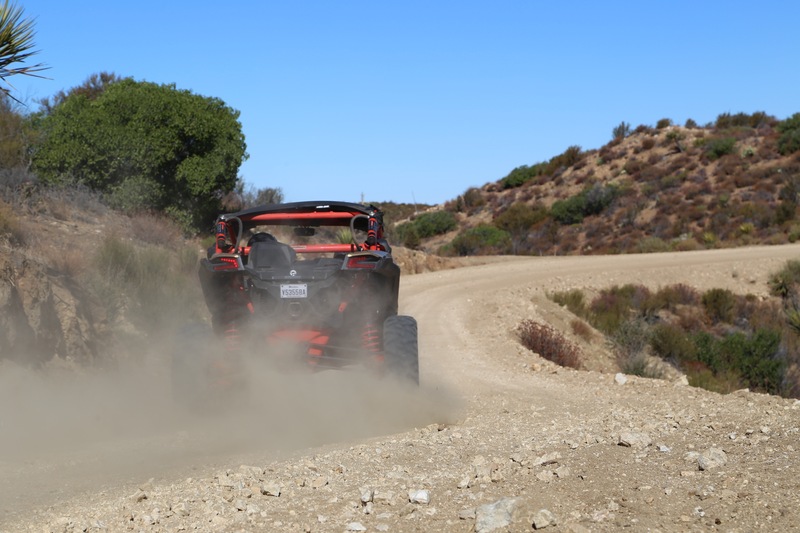 Not only is Can-Am raising the bar with this machine but they are also taking unprecedented steps to give the Off-Road media a true test of the before they hit the market this month. 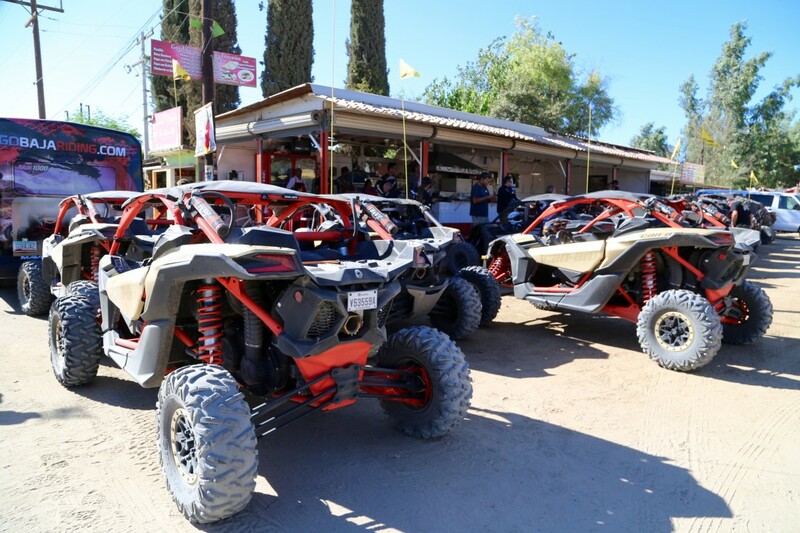 Can-Am invited Pirate4x4.com along for a 2 day, 250 mile test of their new 154 horsepower Maverick X3 over some of the roughests trails imaginable in Baja Mexico. 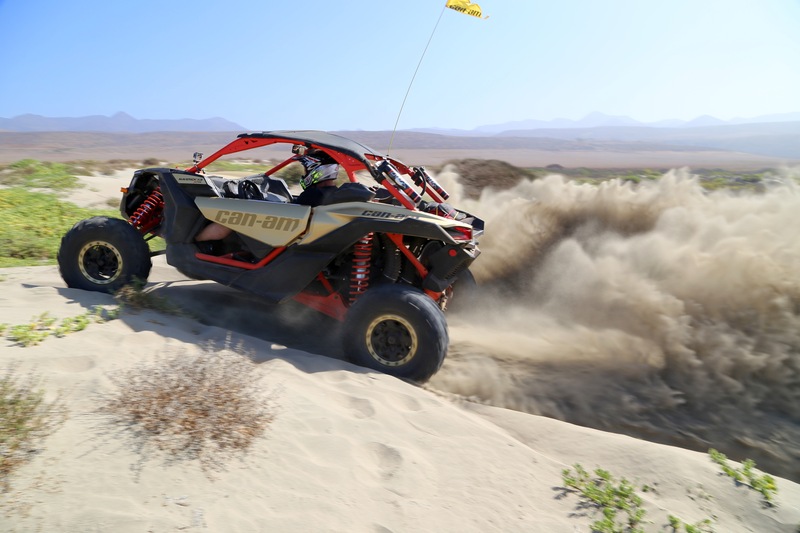 Can-Am knows they have a true driver’s machine and they wanted to get the word out to the broadest audience possible. Can-Am has a new side-by-side and why should the readers of Pirate4x4.com care? After all this is home to garage built Jeeps, Toyotas, Buggies and rock crawlers right? 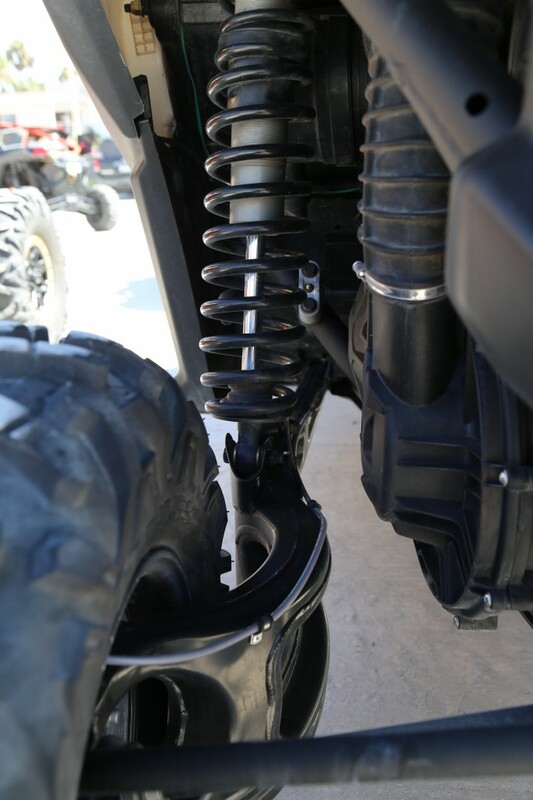 Sure it is, but the cross over into speed, the desert and high-travel suspensions is all over Pirate4x4.com now and Can-Am is stepping into this game BIG TIME with the release of the Maverick X3 platform. When I first spoke to Jerrod Kelley of Can-Am, he told me that the felt this new machine was something that would reach a larger market that they have seen in the past. 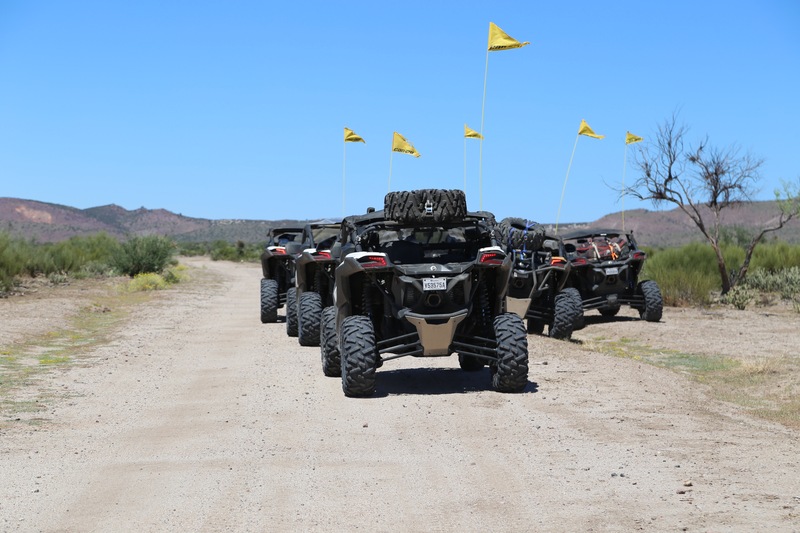 Can-Am has their sights set dead on consumers that want a fast, reliable and comfortable machine to enjoy the outdoors with. Personally, I made the switch from high-end tube buggies to side-by-sides about 6 years ago to do most of my trail riding so I completely understand their focus on Pirate4x4.com readers. 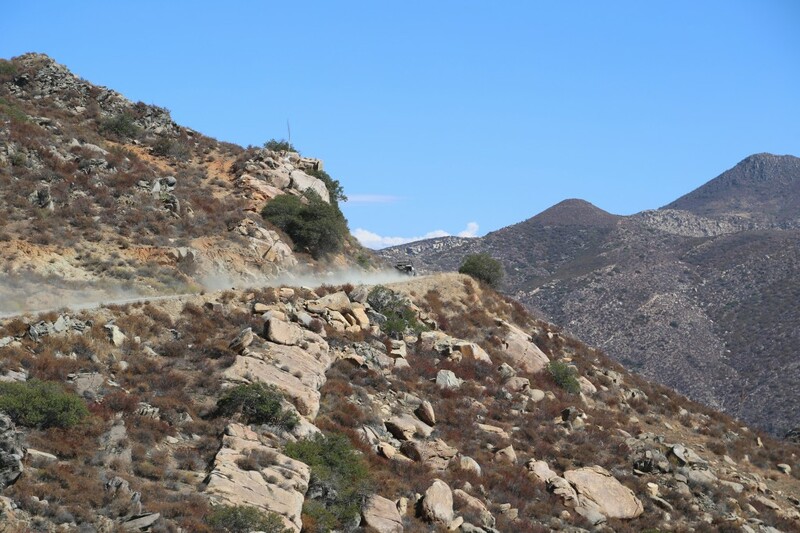 We arrived in Ensenada Mexico, home of the most famous desert racing series of all time, the Baja 1000. Bruno Anderson and his team of professionals at www.gobajariding.com had the entire trip planned to perfection. The Can-Am Team gave us a full technical overview of the machines at the San Nichols Hotel that included a detailed walk-around of the machines and an overview of the side-by-side market. 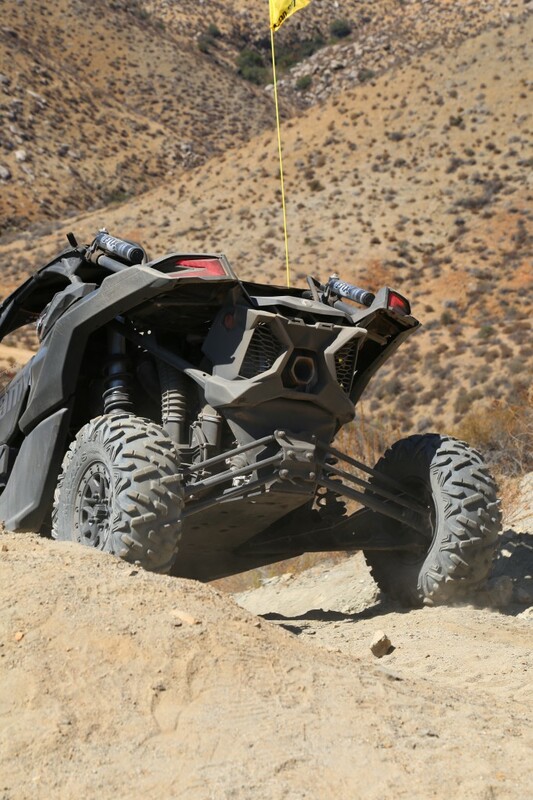 Being a die-hard RZR fan, I took in the details of the rig, but I was pretty skeptical that this car was everything they were telling me it was. 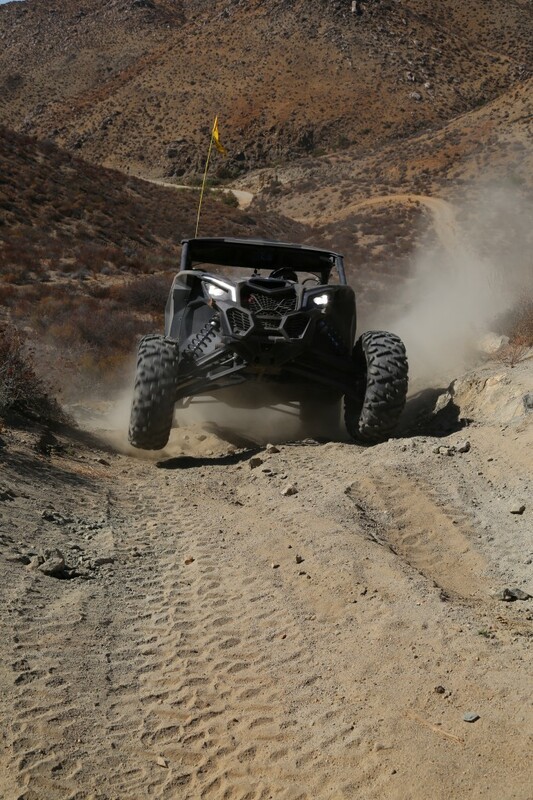 I have seen the competition come and go, but the tried and true RZR platform has always managed to stay on top. The following morning we got an early start down the pacific coast beginning outside of Santo Tomas. We all picked a random vehicle and a co-driver and set off down the coast. 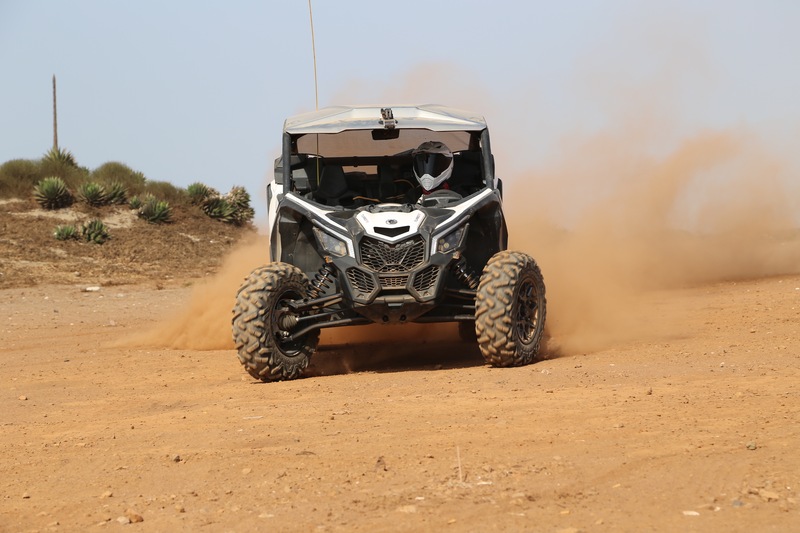 I started off in the drivers seat of the mid-sized model, the Maverick X ds. The X ds is 64” wide has 14” of ground clearance and runs 29” Maxxis Bighorns on each corner. The Fox 2.5 Podium RC2 Piggyback shocks allow for 20 inches of travel both front and rear. 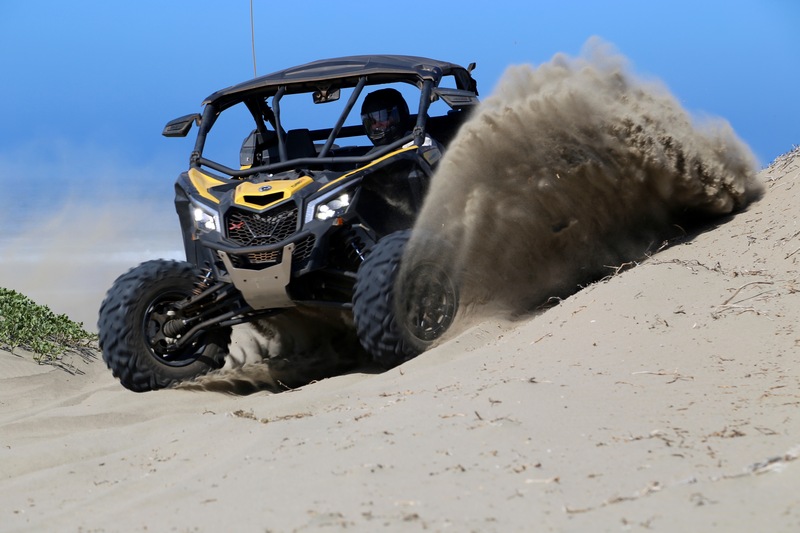 All of the new Maverick X models have the same 154 hp Rotax engine, so power in the same, but each vehicle puts in to the ground in a different way. We spaced out to stay out of the dust and hammered down. Immediately I fell in love with this vehicle. From the immediate power of the turbo Rotax to the massive travel of the suspension, I truly felt like a Baja racer from the first mile in. We pitched this car into corners, hammered it on the straights and aired it out over cattle gaps for the first few hours as we made our way to San Vicente via the beach at Punta Cabras. First impressions. The power of this vehicle is amazing. With the loose surfaces we were on, the immediate press of the throttle was not the most impressive part, it was from mid-range to wide open throttle that was unbelievable. If you made the decision to launch the Maverick X ds over a jump, you can stab the throttle at 50mph and it will take you and your passenger airborne with amazing power and quickness. The mid-level X ds suspension was perfectly tuned for the trails we were on. 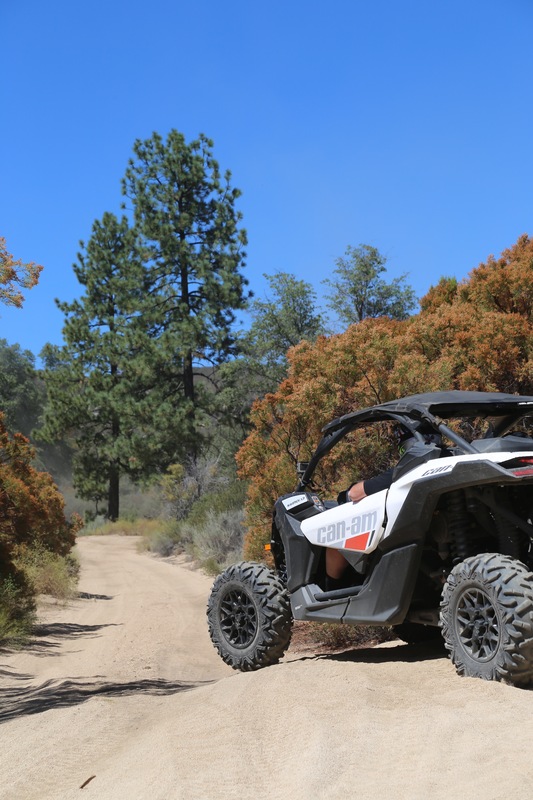 The comfort of the Maverick X3 is amazing for people of all shape and size. I saw 6’ 5” guys sitting without their knees hitting the dash all the way to 5’ 8” guys like me sitting comfortably. 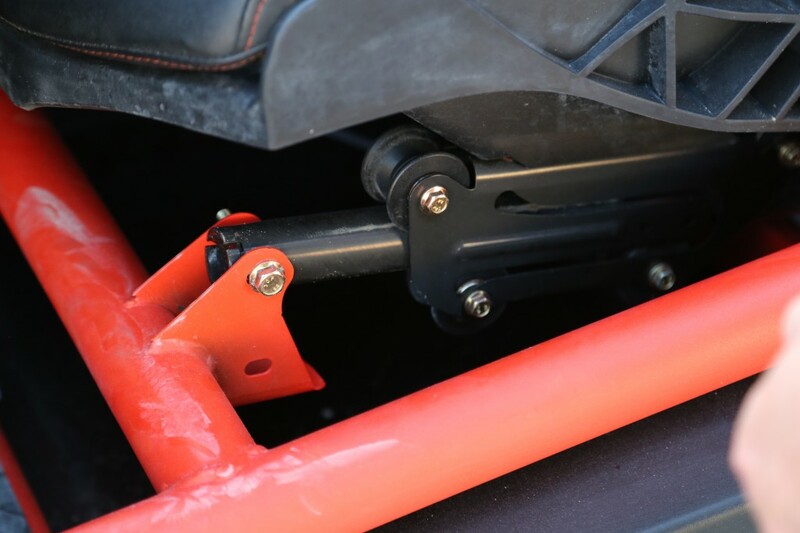 Can-Am designed a brilliant seat slider for both the driver and the passenger that moves up and it slides forward and down as it slides backwards. Simple genius that makes this side-by-side a true one size fits all machine. Also, if you really want to keep your center of gravity low, you can lower the seat slider another 2” in about 2 minutes. Brilliant. After lunch I switched over to the drivers seat of the flagship Maverick X rs. This machine is pure desert beast. Width is a whopping 72” with matching 30x10x14 Maxxis Bighorns on all 4 corners. With a wheelbase of 102” this 2-seat machine is nearly as long as my 4-seat RZR that I love so much for its control, handling and comfort. I was expecting to feel some power loss going to the larger machine, but the way the 10” wide tires and long travel suspension stick to the earth, this machine actually felt more powerful that the X ds I spent the morning in. The Xrs sports massive Fox 3.0 PODIUM remote reservoir shocks with bypasses allowing up to 24” of wheel travel. Folks, this is a serious shock on a serious machine. I can’t stress to you enough how easy this thing is to drive. I literally found myself speeding up into whoops and g-outs that would normally have made me cringe. At one point, they let us take the Mavericks down a steep hill and back up in low-range to get a feel of its crawling capabilities. Here is where I sniffed out the Maverick’s only weakness for slow-speed rocks, the Visco-Lok X auto locking differential. I had heard about these but had never actually used one until today. I will tell you, for the target audience of this vehicle, the Visco-Lok is spot on. Up to this point I was 100% sold. Climbing this hill though made me realize that for slow speed rock crawling, you will need to invest in an aftermarket solution such as the www.halolocker.com As rock crawlers, we are used to this type of selectable locker and adding it to the X rs platform makes this a winning King of the Hammers platform in my opinion. We ended up at Mike’s Sky Ranch at dusk. This place it so amazing. 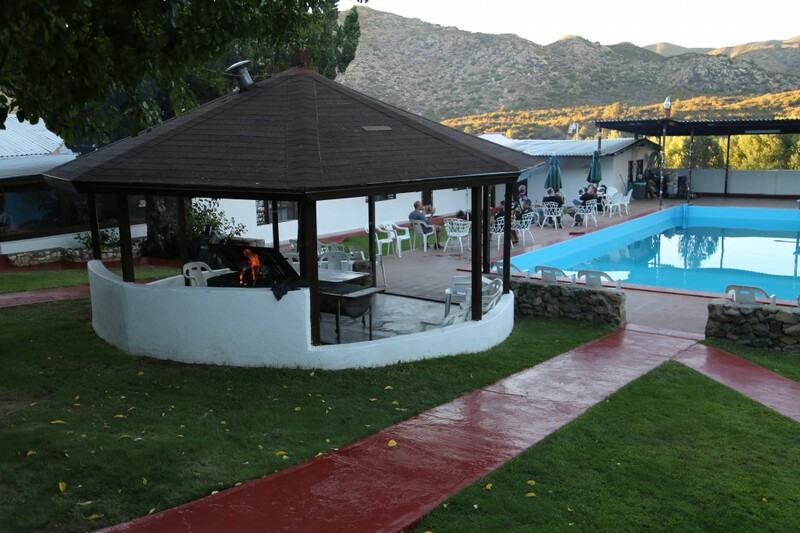 They had a cold pool, cold beer and one of the best steak dinners I can remember ready for us when we arrived. Stories were told and friends were made all while the Can-Am team patiently answered all of our questions until the generator shut off and sent us all to bed without protest. Mike’s Sky Ranch should be on your bucket list. This place is epic. The next morning we peeled out north towards Valley de Trinidad over some of the fastest terrain that we had driven yet. I climbed into the drivers seat of the standard Maverick X3 platform to begin the day. This model has its own kind of awesome. It is the same horsepower and wheelbase as the X ds and X rs but on a 64” wide stance and 28” Bighorns. The shocks are Fox 2.5 PODIUM QS3 with compression adjustment. 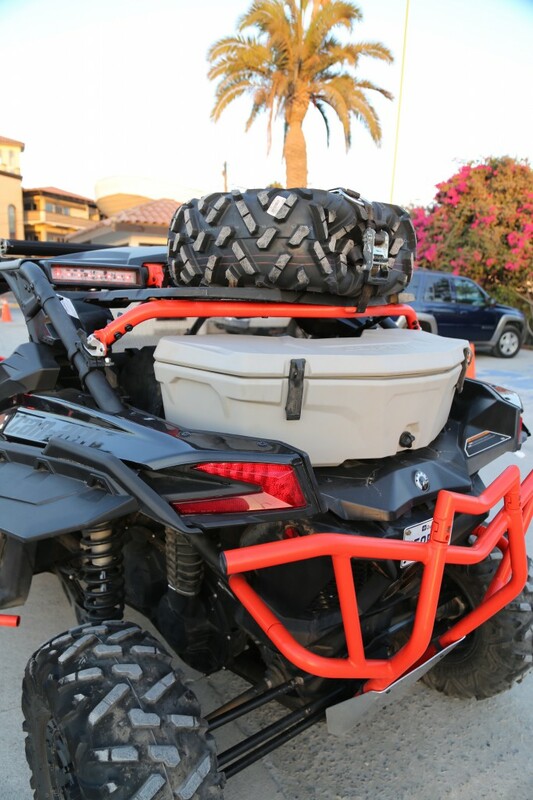 An impressive package for a “base model” Maverick X3. Fast. This vehicle is fast. This particular vehicle had the seat position in the 2” lower spot and it was dialed in perfectly. The smaller tires and the lower seating position literally made me feel like I was driving a rocket. We spent some time in 2wd at high speeds and the vehicle performed amazingly. We were feeling confident and fresh in the cool clear air and we hit the 85 mile per hour top speed often. Even with a passenger, the vehicle launched off the rises cleanly and landed flat every time. I am used to my RZR and its nose low landings and this car makes jumping so much easier. From Valley de Trinidad we had a sweet section of pavement up to the famous Goat Trail that often causes horrific carnage during SCORE Baja races. I had switched back to the beastly X rs model for this section since it was another opportunity to test LOW range. I literally tried to lift a tire on this trail by running up and around every bank and rock I could find but the 30” Bighorns and FOX 3.O’s just soaked it all up without slipping a tire. This climb reminded me a bit of the Moab Rim climb at made me realize that the Visco-Lok will be fine for most all trail situations that most users will encounter. I lucked up next being in the flagship X rs for the next section. 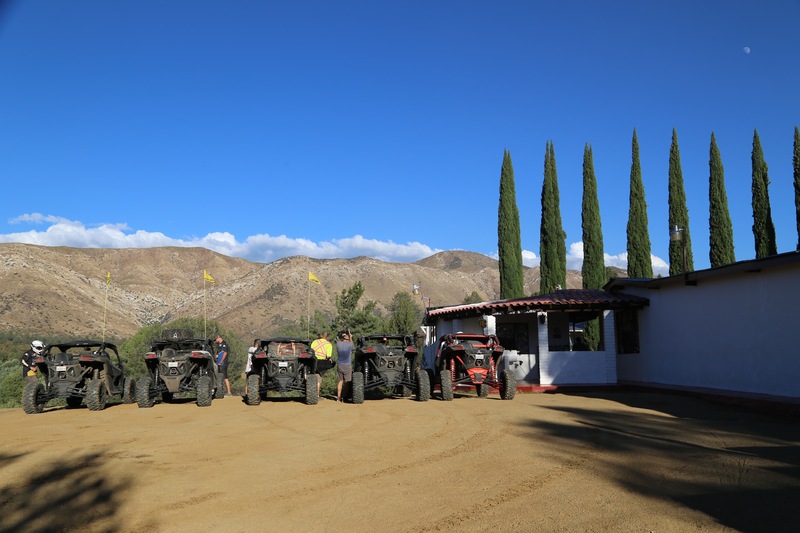 We headed from the Goat Trail to over to El Alamo following the flagged path of the last Baja 1000. This section was super fast with huge G-outs and massive whoops. I found myself taking the X rs faster and faster in these sections to the point I apologized to Josh, by co driver from www.thedrive.com. I just could not make myself slow down. I kept pushing this side-by-side harder and harder as the trail got rougher and rougher. It laughed. We didn’t die. Win-win. We swapped back into the “medium” X ds for the final section through the famous Baja Pine Forest at Laguna Hanson and down to Ojo Negros. This section was similar to the trail riding I do here in the Southeast and was the most scenic. I was glad to end my trip in the X ds because I started with it and remembered it as my favorite. 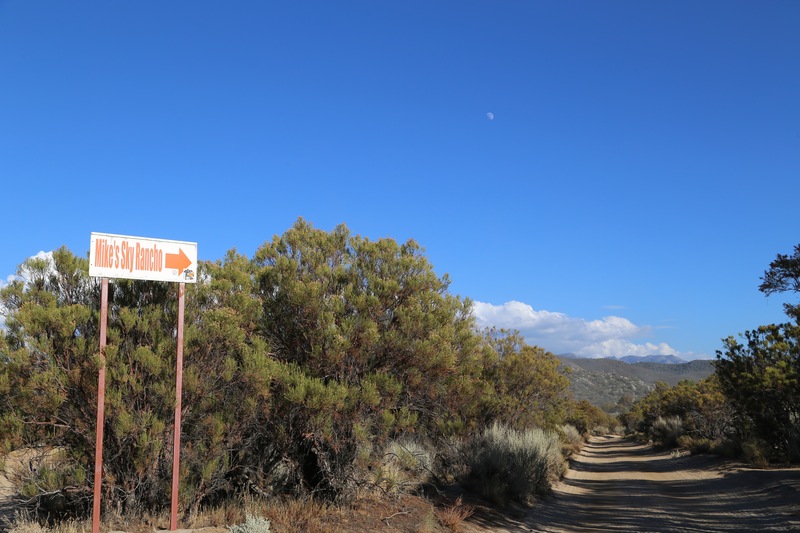 The final section was a 100’ wide washboard road arrow straight and downhill for about 15 miles. I was behind a Can-Am driver in a X rs and literarily pushed the X ds as hard as I felt comfortable to keep up with him and was not able to do so. The wide track Xr s walked away from me every time. Maybe it was just my comfort level and maybe it was the narrower stance but it made me wish for the bigger and badder X rs. With larger shocks, wider stance, 30” tires, full skid plate and standard roof the $1700 premium is a NO BRAINER to buy the X rs model. At $26,699 the Triple Black Maverick X rs Turbo R is the new standard. 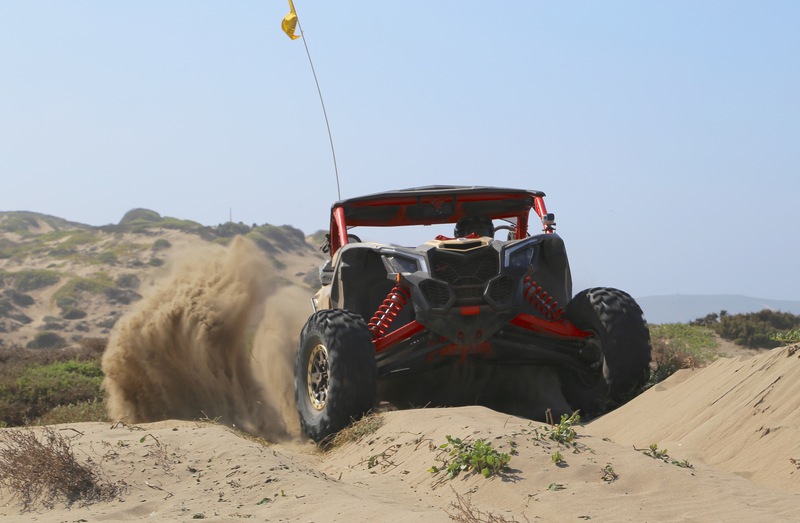 The side-by-side market has been making small incremental steps in the last few years adding HP improvements and tweaks but with the release of the Can-Am Maverick X3, the market has taken a generational leap. This vehicle is the next level. A winner. We literally punished these vehicles as hard as I have seen vehicles being pushed. One was rolled. One was flopped. All were flogged. 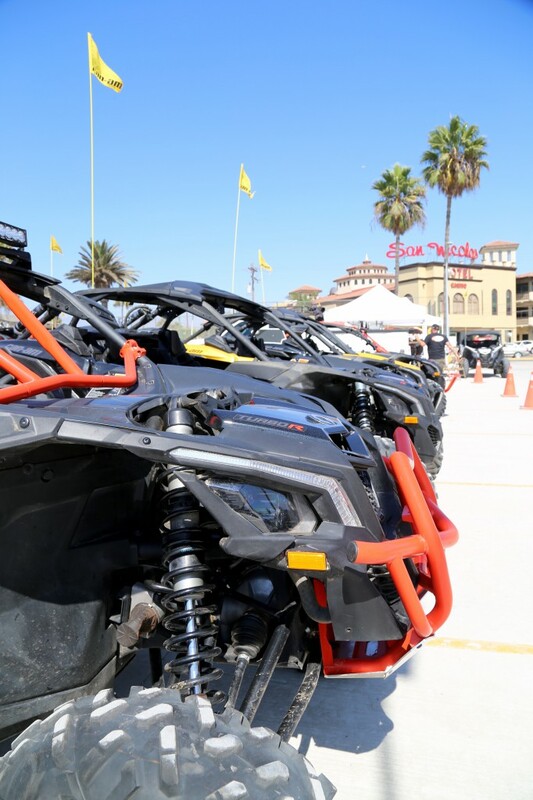 As for carnage, only one Maverick X3 tossed a belt and that belt had about 800 miles of “rental car” miles on it. 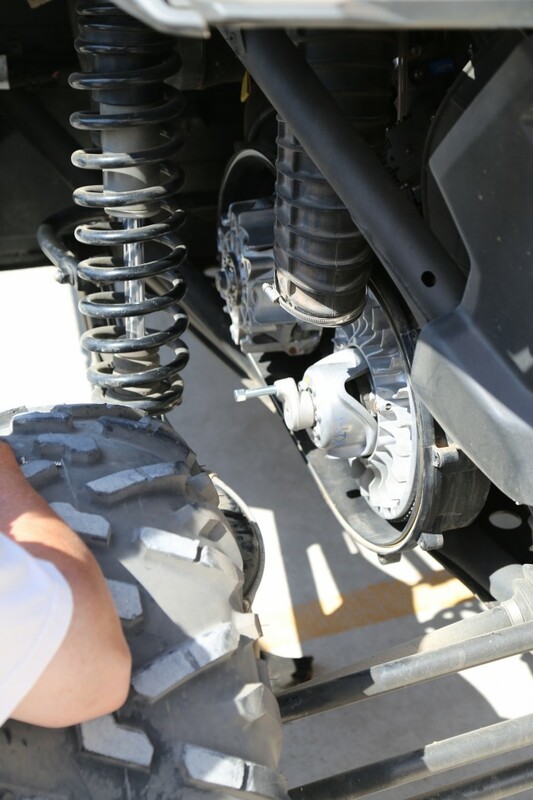 Cool thing is, Can-Am has made the CVT belt change so easy, it took the mechanics 5 minutes to change the belt. Literally, 5 minutes. This brilliant tool is used to compress the clutch to install a new belt. The housing comes off in a minute and the belt in 2-3….even hot. It’s crazy easy. 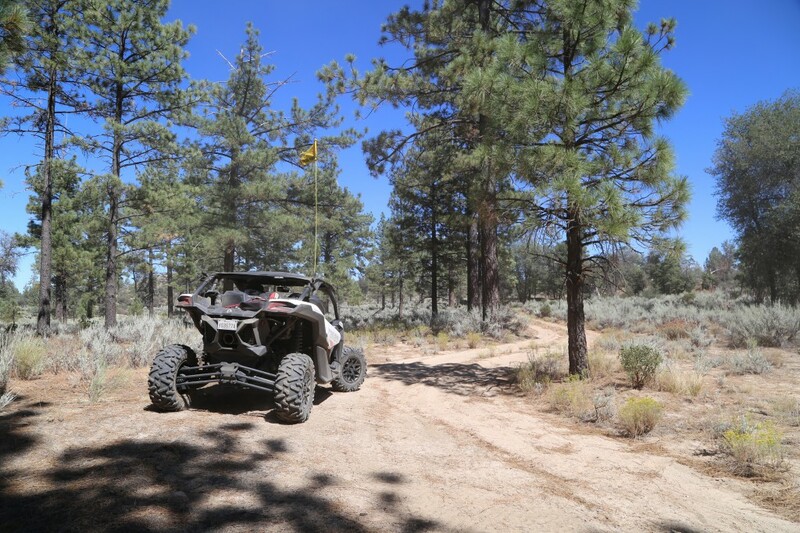 We are all looking to enjoy the trail and the ride. Building rigs is fun but so is quality time on the trail. Some of us want a turn-key vehicle that can take us where we want to go in the most comfort with the least amount of headache. Some still want to build. Either way, is great but no OEM vehicle will give you more bang for the buck today that the Maverick X3 platform. Get out and test one out. You will be sold too. As for why Pirate4x4.com readers should care? During my last trip to King of the Hammers in 2015, I probably saw a thousand side-by-sides on the lakebed. Why? They are comfortable, safe, quick and affordable compared to a custom built vehicle. The desire to go fast and cover lots of territory in comfort has boosted the side-by-side market in the last few years. Many side-by-side buyers are moving over from Jeeps and rockcrawlers, not to mention high-end sand rails. These things are awesome. Before you decide you don’t need one, give the Maverick X3 a close look.